We took our departure from Islay on Friday 18th May at just after 1300, to catch the north-going tide. 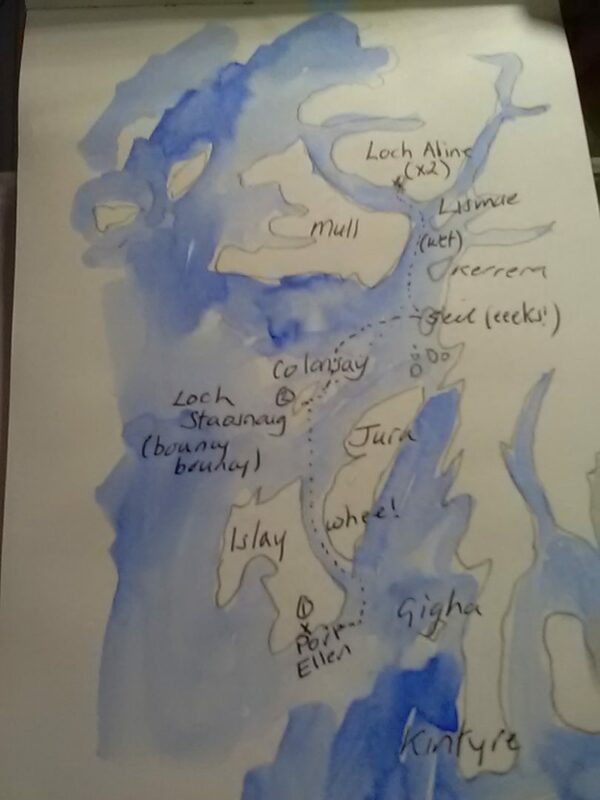 At first we thought it might be best to go east of Jura, but the Sound of Jura gets narrower at the top end and squirts you through the Sound of Luing, so you need to work the tides, and we needed to be in Oban by Tuesday for Katie to catch her plane home. A quick change of plan saw us shooting through the narrow Sound between Islay and Jura with 5 knots of tide under us. Great fun! There was not much wind so we motored through at a speed over ground of 10 knots. 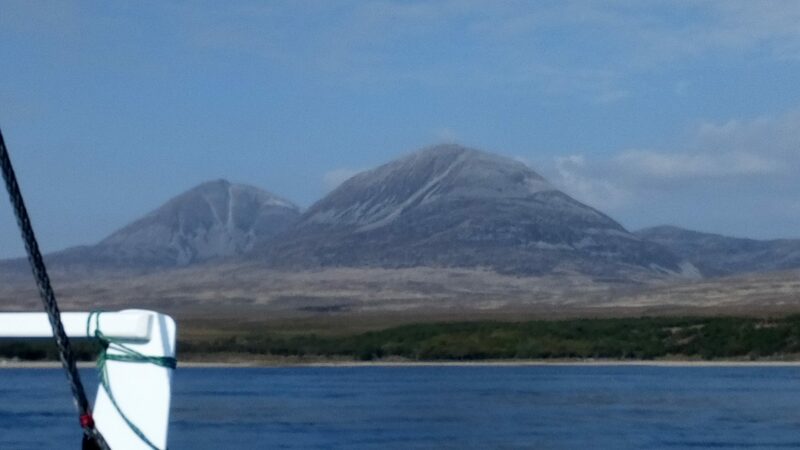 The Paps of Jura were majestic in the sun, and for me this was the first voyage in unfamiliar territory. 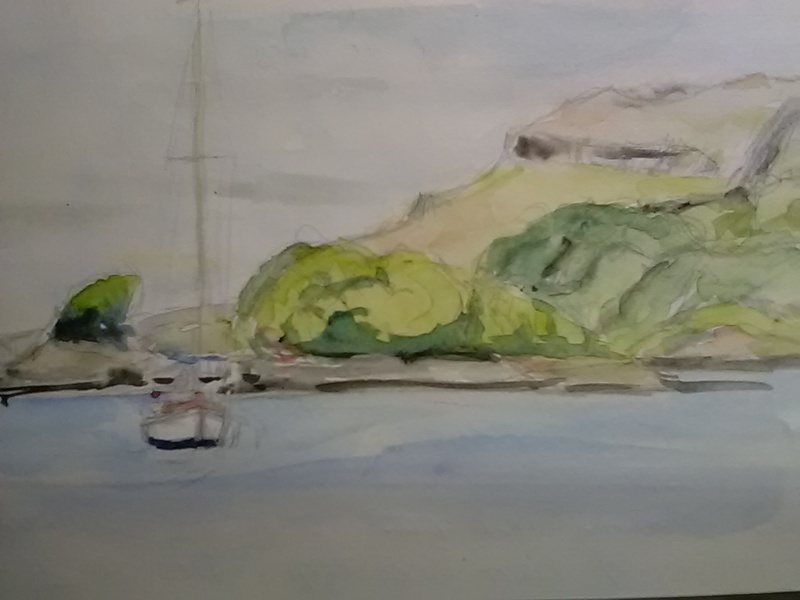 We dropped anchor in a little cove on Colonsay, and although it was quiet for half the night a swell set in and bounced us around until we could bear it no longer and set sail at 0800, heading up the Firth of Lorne. Mull stretched out to our right, Iona just too much around the corner to be visible. 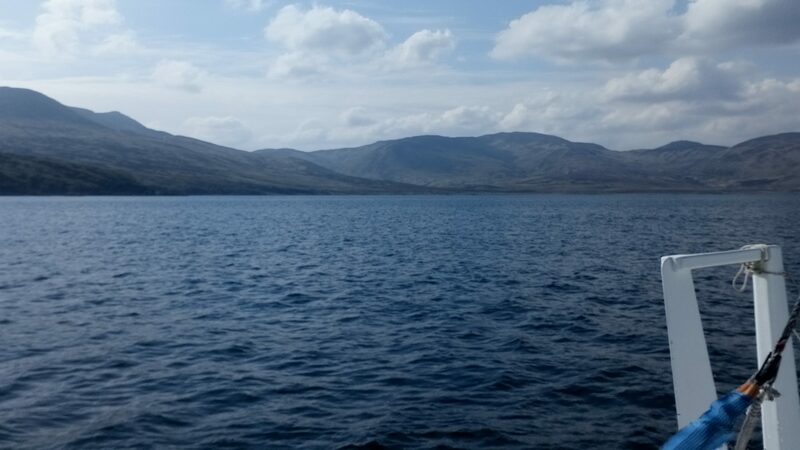 On our left was the top end of Jura and the cone of Scarba with the awesome Corryvreckan between. A broad reach, almost a run, top speed 11 knots through the water. We were entering yottie heaven! As the wind was from the south east, the waves were small and allowed the boat to fly. 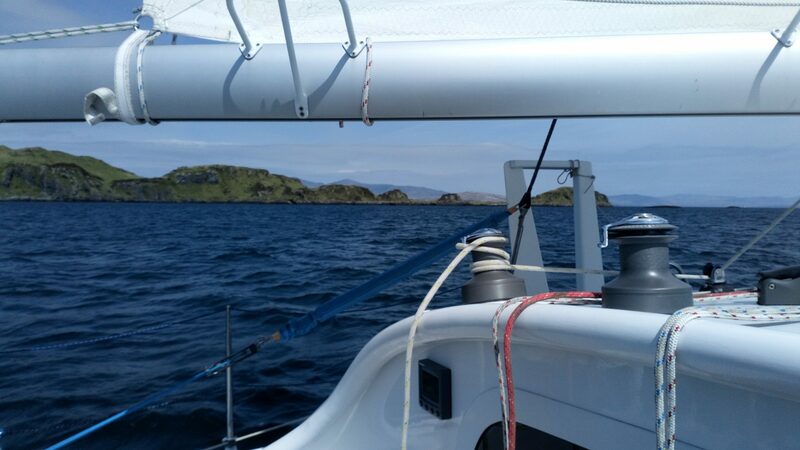 We passed between Insh Island and Seil, roaring along. 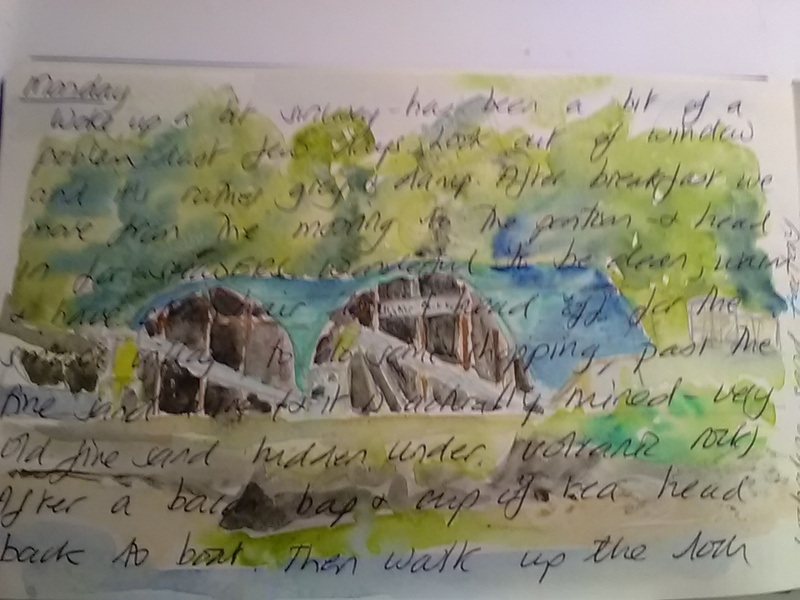 Our chosen destination was Puilladobhrain, an enclosed inlet with a pub and the famous Clachan bridge only half a mile away. But it suffers from being too well known, so there were quite a lot of boats, and monohulls tend not to give multis enough swinging room. Slightly anxious night for the skipper, but thankfully no problems. 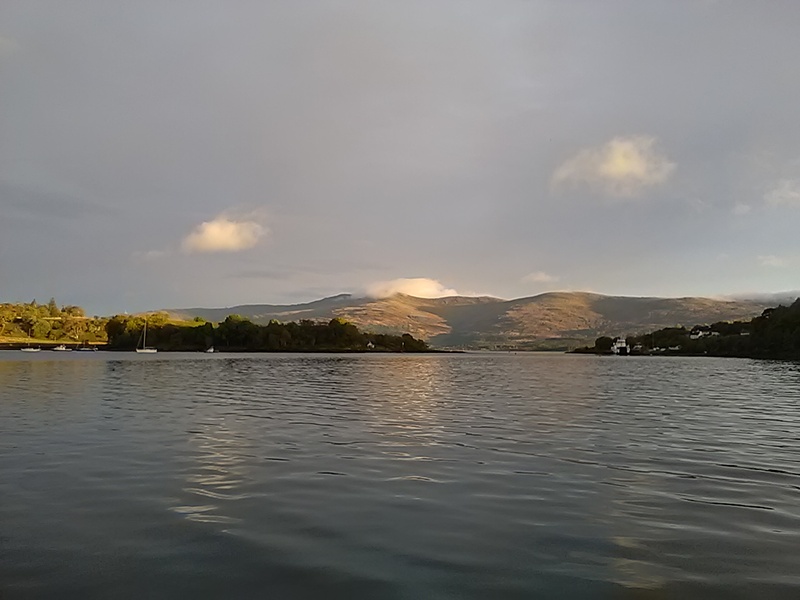 The intention had been to stay put while some rain came through, but it cleared by about 1300, so we departed and sailed up past the corner of Mull to Loch Aline. Not many boats around on a misty afternoon, but plenty of ferries to avoid. Katie’s map of our route. Loch Aline is very pretty, mostly surrounded by woods, but with a sand mine near the mouth. This is pure silica laid down when Scotland was in the tropics (hard to imagine, I know!) and then capped with igneous rock from a volcano. The mine workings extend several kilometres underground, and heaps of clean white sand are exported from here to make solar panels. We have stayed a couple of nights here, as today was wet and largely windless. Humidity inside the boat has reached over 90%, almost enough for our own rainclouds. The showers at the pontoons are among the best of the trip so far… a good enough reason alone for a second night! Thanks to Katie for her lovely sketches.